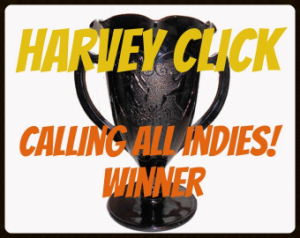 Please join us in congratulating Mr. Harvey Click for being this month’s CALLING ALL INDIES! winner! The Dirty Little Bookers witches will be reading and reviewing Click’s horror, The Bad Box. Stay tuned for an author interview, character interview and more, and pick yourself up a copy by clicking on the cover image below so you can join our ongoing discussion about the book and author. A warning, though: not all witches will be reading The Bad Box. It’s too scary. Honestly, really dark. Those of you who can handle gore of the scratch-at-your-spine, something’s-behind-the-couch variety, get onboard ’cause it’s badass. Thanks, John! We evil mothers have to stick together.